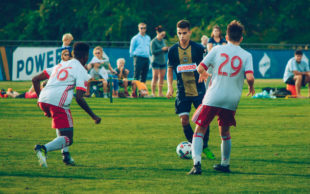 Bethlehem Steel have signed 15-year-old Philadelphia Union Academy midfield standout Selmir Miscic. Miscic, a U.S. youth international from Royersford, Pa., is the youngest player to sign a professional contract with either Bethlehem or parent club Philadelphia Union, almost four months younger than former Union player Zach Pfeffer was when he signed with the Union in December 2010. While Bethlehem has featured Union Academy players in USL games, Miscic is the youngest to sign a professional contract, and the goal is for him to progress onto a contract the Union, much as Derrick Jones and Matt Real have done. Miscic has shown clear dominance at his own age level with the academy and was highly influential for the U. S. Boys U-15 side in a recent Torneo dell Nazioni in northeastern Italy and Slovenia, assisting on the game winner against Italy and scoring against Croatia and Macedonia. Last season, he made 26 appearances for the Union U-15s, scoring 33 goals in all competitions, and he has scored twice this season for the Union U-17s. Earlier this month, he scored the tying penalty kick and took the late game-winner for the U17s to secure a win against the strong developmental academy program NYCFC. In the process, he was named PSP’s Player of the Week. Miscic is currently set to train with the U.S. U-16 National Team in Bradenton, Fla. until Sep. 19. After that, he would presumably return to return to train with Bethlehem and their parent club, Philadelphia Union. Miscic had his first full practice with the Steel earlier this summer, fitting in well after having been welcomed cordially by his practice mates, but not exerting a dominating influence on his first day. In an interview, Miscic indicated that part of his decision to sign with the club was that he could stay home near friends and family while simultaneously advancing his soccer career and academic work through the Union Academy. Burke expects that Miscic’s next step will be to move up to the U19s in the Union Academy. Miscic will practice with the Steel, and Burke ruled nothing out in terms of the Miscic playing with the Steel in the club’s final four games. However, Burke expects to proceed conservatively and cautiously with this new teenager, carefully maximizing the young man’s opportunities for successful development as Bethlehem pushes towards securing a playoff spot in its last four games of the season. Bethlehem’s next match is Sep. 22 against Toronto FC II. Miscic will wear No. 55. He was clearly a player the team had identified. I’m glad it seems we are consistently able to get these young men to sign and stay with the team. Really building a base of young talent and a culture that plays them. This is all good news. Well done to all involved and good luck to the kid. I can’t wait to see him scoring goals for the U for a few years at Talon, before, hopefully, he’s off to Europe for a BIG transfer fee.